Lazy Gramophone | Journal - Zoe Catherine Kendall's Five Things. London based interdisciplinary artist, writer and jewellery designer Zoe Catherine Kendall is busy inserting herself into the gaps between varied definitions. After graduating from a Jewellery Design BA at Central Saint Martins in 2007, Kendall went on to launch her own jewellery brand which has been represented by several independent galleries and larger shops in around London including Kabiri, Selfridges, The Last Tuesday Society and Johnny Rocket. However, unsatisfied with being introduced by friends as a Jeweller, in 2010 Kendall began her own blog as a place to think and write about the inseparable processes of living and making art. Shortly afterwards she was invited to write the artist blog for Run Riot. This was to become the perfect opportunity for her to combine her distinctive styles of visual art with her use of the written word, allowing her the freedom to construct cross genre pieces which she broadly describes as treatments of existence. This alongside reviews and interviews of artists and figures whose work inspired her practice. 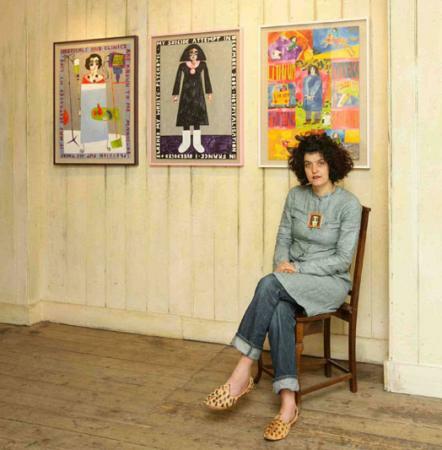 Her current body of work explores various mediums of expression including spoken and written word, illustration, painting, moving image, performance, installation, book and diary art, momento making, collected paraphernalia and body adornment. Kendall believes that by allowing herself a freedom in her forms of expression, the diverse methodologies she calls upon to voice her ideas will merge together, forming a whole story from their fragmentary parts. These fragments she says, are a much more authentic reflection of the thought process and ultimately result in a more immersive experience for her audience. Five Things that have Inspired my Art and Writing. Five pieces of art that have inspired and influenced my art and writing practice? That's tough, there are so many to choose from, many of which have guided me on dark nights or fruitful days in the studio, or shown me how to be comfortable and be free in my art, using my life as a starting point, a great assimilation of stories and their lessons. I'll have to be picky. Samuel Beckett, Happy Days (1961) - Let's start with 'Happy Days', a play by Samuel Beckett. I saw a life changing production of it at the National Theatre in 2007. 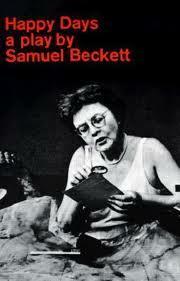 Beckett's work is so emotional and revealing, often using absurdity as a remedy for life's pains. For a man, he seems to have a fairly unique empathy for a woman's worries and woes and moreover, a deep understanding of the human condition. The voice which reoccurs in various guises in his many monologues delves into experiences at the level of 'the self' and are incredibly familiar to me. Another lesser known piece of work by him that has shaped my work to date is 'Texts For Nothing'. 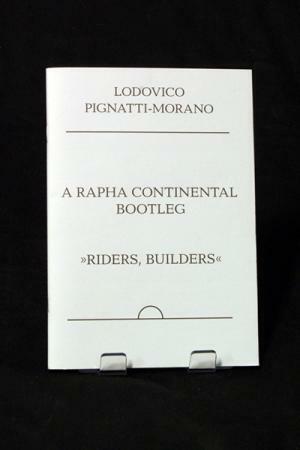 Ludovico Pignatti-Morano, A Rapha Continental Bootleg (2009) - Next up is a piece of writing: 'A Rapha Continental Bootleg' cycling monologues by Ludovico Pignatti-Morano published in 2009. He's a young writer and it's a very fresh piece and had a big influence on me when I was writing 'Fragments of A Storm Suspended in Time'. If you know it, you'll see my references to it. It encompasses a love of racing bikes with a modern attitude and minimal approach to writing. It's very tight and full of beautiful metaphors about riding, writing, love and ideas. 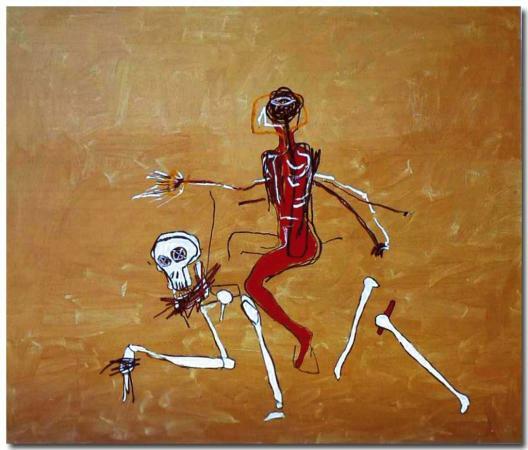 Basquiat, Riding with Death (1988) - That takes me succinctly onto a painting by Basquiat, one of his last 'Riding with Death' 1988. There are some beautiful references to him in the cycling monologues. I am greatly moved by primitive or raw art, psychiatric art and that which resembles the bold hand gesture of a child. Basquiat channels this rawness and freedom of line eloquently, especially so in this painting which was an omen for his own death. A masterpiece for Basquiat and a pointer for me to remain free in my drawing, painting and writing. 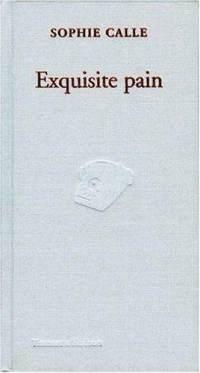 Sophie Calle, Exquisite Pain (2004) - Conceptual artist and writer Sophie Calle's 'Exquisite Pain' helped me to surface at a time when I was in a lot of pain. The honesty and frankness and the journey she traverses toward a restored sense of calm is didactic. She taught me that is was okay to talk about personal anguish, to use it in my art, to share it and grow from the experience. I found it very therapeutic after having suffered a major breakdown. 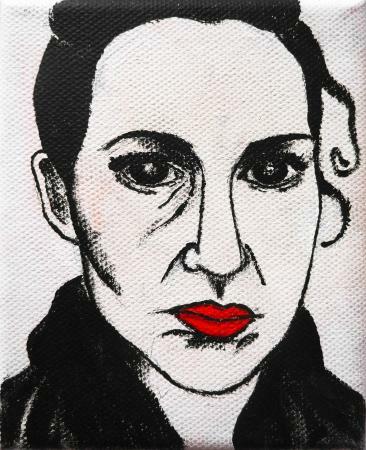 Josephine King, Life so far (2010) - Last up is an exhibition of paintings by Josephine King entitled 'Life So Far' which showed at Riflemaker in 2010. In these paintings King lays bare her experiences of extreme bipolar including suicide attempts and references to female artists including Rebecca Horn and Marlene Dumas, in slogans surrounding brightly coloured, Kahlo-esque portraits. The honesty and bravery inspire me to work from my own experiences of mental unease. Tags for this post: Lazy Gramophone, Time Project, Zoe Kendall.